Do you know anybody that reminds you of Eeyore* from Winnie the Pooh? Somebody who's down on their luck and wants everybody to know it? I'm around people like this on a regular basis and I've learned that their condition tends to be contagious. When you start to talk to them about their faith, you typically get a statement like, "God hates me" or "God doesn't know I exist" or "God doesn't care about me." This time of year it comes out a little bit more and when we retell the story of Gabriel appearing to Mary (Luke 1: 26-38), I almost always get the question, "What made Mary so special that the angel told her she was 'highly favored'?" The answer...nothing in particular and everything altogether. Later, as Jesus gathered with tax collectors and "sinners" and the Pharisees began to scrutinize Jesus' companions (Luke 15), Jesus told a series of three parables: the lost sheep, the lost coin, and the lost son. The lost son, also known as the prodigal son, gets a lot of airtime and it's one I point to that illustrates John 3:16 very well. Some people read the story and see it from the older brother's perspective - the father is showing favoritism for the younger brother. Some read it from the younger brother's angle - I was lost, but now am found. Some from the father's vantage point - I love my sons, both of them. Thank God this one has returned home. God sees us from the father's viewpoint. Neither son is favorite, better, more loved, or more distinguished. 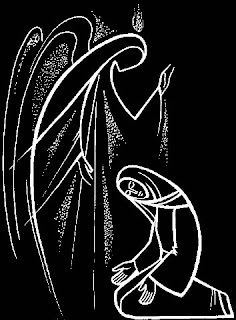 Just like Mary, each of us has been created by God, in the image of God. Each of us is a part of the world God sent the Son to save. Each of us has worth and each has God's favor, even when God doesn't have ours. Even in our worst moments, when we are most unworthy, God has deemed us worthy and redeemable. That proves God's love for us - that his arms are always open to us, as the father's were to the lost son, and he desires to use our lives for great things, just like Mary. I have a friend that has expressed to me that he feels disconnected and distant from God for the things that he has done. What a shame that we have allowed people to think they can be unforgiveable. Our greatest gift at Christmas each year is Christ. It's not the New Year or our resolutions that allow us to make a fresh start - it's the baby, born in a stable, and the life he lived, death he endured, and resurrection that was, that gives us a fresh start. Mary was favored by God...but so are you! Tell that Good News to everyone you can. *On a side note, I discovered last week that the man who does the voice of Eeyore, also did the voice for Optimus Prime, both in the cartoons from the 80's and the two movies from recent years. Just some more pointless knowledge for you to accumulate. How would you sum up how to live your faith? If someone new to faith in Christ asked you how to live out their new faith, what would you tell them? Would you tell them that they need to go to worship? ...to give to those in need? There are 613 commandments in the Old Testament - I haven't counted them, but I'll trust my OT professors from seminary on that fact. Teachers of the law - pharisees, saducees, and others - memorized each one and "helped" people keep each of the levitical laws so as to be in alignment with the will of God. 613 that ranged from "Thou shalt not kill" to how to properly prepare your dinner. One day, while he was teaching, a local lawyer came to Jesus and asked him which of the 613 commandments was the greatest. Is it one of the big ten? Is is about how we worship, pray, give, or live? The perfect commandment is that we should love. "Love the Lord your God with all your heart and with all your soul and with all your mind and with all your strength" (Mark 12:29-30, NIV, emphasis mine). That is to say that God is more concerned with who we are and what our motivation is. If we love God and we love others, our lives and our daily actions will reflect that - and the 613 regulations for life become tools to aid us in our attempts at Godly love. I've recently gotten to try something new. 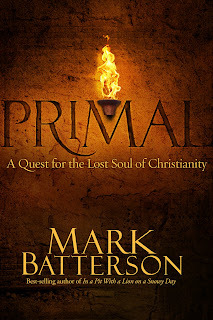 Having been in the right place at the right time, being a pastor and a blogger, I've had the incredible opportunity to preview Mark Batterson's new book, Primal. Primal will hit the bookshelves on December 22nd and if you've read In a Pit With a Lion on a Snowy Day or Wild Goose Chase, this new book stacks up with the other two - no question. Many of you know that In a Pit is one of my favorites and has been foundational for me when it comes to ministry approaches. Primal is based on the Greatest Commandment: "Love the Lord your God with all your heart and with all your soul and with all your mind and with all your strength" (Mark 12:29-30). What does it mean to love God, not just in some wishy washy, feel-good way, but in the truest, deepest sense. Obedience to the greatest commandment is real commitment. It's the mark of a living faith and if we can regain our focus on these four ways of loving God, everything else just becomes trimmings. We forget that sometimes and get caught up in trying to "earn our way into heaven" or be perfect or have all the right beliefs - and when we lose focus, we do so at our own peril. Truly, we can do God's work and still forfeit our own souls. Mark does a fantastic job of helping us explore what it means to love God with all of our heart, mind, soul, and strength. The facts he shares and the stories he tells are captivating and leave you with a new appreciation for what true, godly love is. When was the last time you tried to define how you love God with all your soul? Batterson might be able to help make a few things come together for you personally. Do this: when you get some cash or a gift card for Christmas this year, spend some of it on this book. If you're pastor, read this one as soon as you can get it. It's an easy read, but also one that has the potential to give a great deal of focus to the rest of your year. I plan to spend part of January and February sharing the message of Primal from the pulpit and with my staff and leadership. Thanks to the people at WaterBrook Multnomah and Mark Batterson for giving me the opportunity not only to preview this book, but to be one of the first to promote it. Please pray for one of our members, Jason. He's a husband and a father of two and has metastatic malignant melanoma. He was diagnosed back in April, but now the clinical trials that are his last resorts aren't even working. In the last two months, he's gone from one tumor on his liver to 9. No word on if there are any other treatment options for him. Just pray. Jason is 34 years old with a son in 9th grade and a daughter in 5th. Almost daily, I get forwarded emails from people that want to say bad things about our President. I've posted about it a couple of times and I know that some people have read it and immediately said to others, "I bet he voted for him!" Before I begin, let me start off by saying that I was taught growing up that your vote is a deeply personal issue, best kept to yourself. When my parents voted, I never, ever, had a clue which way they cast their ballot. I was taught that sharing your own preference is of NO benefit to anyone, especially yourself. The world is divisive enough without having to choose sides around politicians. So, for those reading my posts, rest assured that I will NEVER tip my hat one way or another about who I have or will vote for. A young man sent me one of those forwards today - a college student I know with the intention of going into full-time, evangelistic ministry. I popped him a quick reply to try to share some wisdom with him. You see, as ministers, we don't have the luxury of opinions a lot of the time. If I pass along my political views to others, I may gain additional "support" from some, but simultaneously offend or turn off others - people who may have voted for or that may agree with the politician that I disagree with. I run the risk of burning bridges for the sake of a joke or making a point - bridges that may be best used to share the Good News of Christ with others. Despite popular opinion, God is not Republican or Democrat - God is much bigger than either side of the aisle and he's about people, not politics or issues. I am a minister of the Gospel first. For that matter, I might recommend the same advice to anyone who would prefer their faith to be of greater importance than their political views. End of disclaimer. Not far from where my parents live, the Mayor of Arlington, Tennessee has declared some pretty outrageous politcal views, and like many he dragged God into his disapproval of our President. Read about it HERE. I've heard, several times over, arguments that our nation's leader is a heathen Muslim and is disrespectful of the fact that our country is a "Christian" one. I may have heard it one too many times today. Especially since I was more interested in what the President's military plan would be in Afghanistan - where I have friends and family - would be than I was in watching Charlie Brown Christmas for the hundredth time - as I imagine several of Mayor Wiseman's constituents did as well. Somebody buy this guy the Charlie Brown Christmas on DVD already! I do want to help us set the record straight. I was in seminary when George W. Bush and Al Gore John Kerry were pitted against each other in the 2004 presidential campaigns. At the time, one of the professors at Candler offered a class entitled "Religion and Politics in America". I enrolled and looked forward to getting some good stuff. The class ended up being dreadful - I actually cut at least half the classes (though I still passed with an A). It was the kind of class where the professor would have us read the material and would spend the whole 3 hours reading it back to us. I did learn some things about our nation's history though. We call these our First Amendment Rights. They give us the right to worship as Christians, Jews, Muslims, Mormons, Buddhists, Hindus, Rastafarians, Zoroastrians, or any -ism we choose. In fact, if you go back and study the faith of many of our founders, you'll find that several who signed their names to the Declaration of Independence and the Constitution weren't Christian, they were Deist. Deism is a "religious and philosophical belief that a supreme being created the universe, and that this (and religious truth in general) can be determined using reason and observation of the natural world alone, without a need for either faith or organized religion." (read more here) Thomas Jefferson actually took scissors to the Bible and made his own by cutting out all the parts about miracles, the divinity of Christ, and all other non-Deist beliefs. I will go on record as saying that I'm a proponent of the separation of church and state. Look at Iran and the mess they're currently in because the state IS the religion. Look at the history of the UK and how many wars there were as proponents of Catholicism and Anglicanism came and went from the monarchy. Heck, even Nazi Germany claimed to be its own brand of faith. When there is a separation of church and state, the church becomes the accountability for the state. When there is no separation, there is no accountability. I am a Christian. I have devoted my life and all therein to loving God with all my heart, soul, mind, and strength. I thank God for the privilege of being born in a part of the world where I can proclaim my faith freely, not to mention earn a living by doing so. I thank God as I remember the people in the Middle East and Asia who don't have that freedom and as I pray for them. I am a Christian and I am an American. The two are as different and unconnected as the fact that I am a male and I am right-handed. I am proud of my faith and my citizenship, but neither is responsible for the other. I don't know what faith Barack Obama claims as his own. His autobiography talks about the encouragement his mother gave him to explore all faiths until he found one that fulfilled him. He also attended a United Church of Christ. It may be that he is a man of deep faith, but called to lead people of many faiths, and chooses to not advertise that faith. I don't agree with that, but his decision is between him and God. Maybe instead of trying to object to how a politician ties his shoes, what tie he wears, or how he expresses his faith, we should look at how we express our faith. Maybe we should also look at how we express our politics, get our facts straight, and determine if our politics are damaging to our witness. The world will be a better place when all people have the freedom to choose whatever faith they want and Christians remember to act like Christ so that all of those free people will want what we have. I guess that even if my viewpoint isn't favorable to you, I probably won't have as many political forwards to delete from my inbox. In an age where we are instantly accessible with Blackberries and iPhones, any forward is a bit offensive, don't you think? Back in June, I got to spend some time with friends at Annual Conference. That's the big upside to heading to Athens for a week each year - reconnecting with people that you know well, but serve hours away. Many of my friends are church planters, or plan to plant churches one day. I hear their stories and I'm encouraged. Chances are, I'll one day serve one of these newer churches, even though I have no expectation of planting one myself. The resources available to church planters, in terms of ideas, coaching, and support, seem unquantifiable. The biggest challenges they face are funding and drawing in that first critical mass to be self-sufficient. As we talked about some of these things, I voiced my frustration over not finding any significant resources for breathing new life into an older congregation. This is the kind of ministry I'm in, but for the most part, I'm on my own. In my few years of ministry, I've learned that for lead/senior pastors, you're going to be in one of three stages of ministry: planting new churches, nurturing and leading existing, stable, fruitful churches, or striving to reinvigorate a declining church. There doesn't seem to be a fourth option, unless you want to throw in the inept pastors that ride the declining church into the dirt (or the churches that self-sabotage and choose to die). That was a big lead-in to what came across my desk this week. The friend I voiced my concern with months ago sent me a link to an opportunity this week. A pastor in Illinois who successfully turned around a church has decided to offer a coaching opportunity for 12 ministers over the first 6 months of next year. What an opportunity - what an answer to prayer! Just the chance to conference with others dealing with the same challenges and to share methods and ideas. Needless to say, I had the application request form filled out online in mere seconds and waited impatiently to hear back. Yesterday I got a reply. Included was more information and an application. I was already thinking of what I might say in my 5 minute video application when I read over the information for the program. For six months of coaching - one meeting per month (online) and the opportunity to connect with 11 other ministers (online) - the cost is $1,200. That doesn't include flying to Illinois, renting a car, reserving a hotel room, and all else for a trip to meet in person toward the end of the meetings. It doesn't include books to read and materials to buy. I know that this coaching could be immensely valuable and might contain something that will help things get off the ground here at Mt. Bethel. But I can say this - my continuing education fund is only $750 per year and the church I serve is doing everything it can just to pay the staff and fund basic ministries. The new ministries we're trying to adopt to achieve God's vision for the church are currently limited to things we can do for nominal or no cost at all. Raises for our staff are out of the question for 2010. $1,200 is more than we can spare. So here's what I'm proposing: An expense-free opportunity for ministers in the same boat to connect. If you're interested in networking or know someone that might be, please email me: alexander.stroud (at) gmail.com. I'm looking for lead pastors / senior pastors that are trying to transition the churches that they serve. If you're on the other side of the experience and you've already accomplished this, I want to talk to you as well. Please help spread the word. A few dozen of you follow my weekly rantings, but we need more for this project.